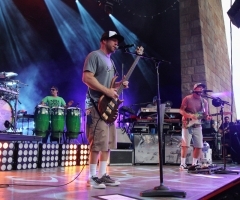 Slightly Stoopid’s School’s Out For Summer Tour kicked off at the beginning of June with reggae dub band, Stick Figure and three-piece rock reggae band, Pepper. This tour is a total of seven weeks spanning the entire country. We were fortunate enough to catch the fifth show of the tour in Avila Beach, CA at one of my favorite outdoor venues overlooking the ocean. Pepper started off the night with a high-energy set, just like they always do. Bret, Kaleo and Yesod are so fun to watch onstage because they put 110% into every performance and are just shamelessly themselves. Pepper always knows how to connect with their crowd, making their show memorable every time. In between songs, they gave a shout out to a little boy holding a sign that said, “Stoked, this is my first concert” and took the time to take a picture with him after. I think that says it all about the kind of band that Pepper is! It was cool to hear them mix things up in their set by playing songs off classic Pepper albums like Pink Crustaceans & Good Vibrations, as well as their newest 2016 album Ohana. 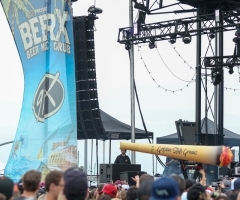 Both Pepper and Slightly Stoopid have been around for over 20 years, so this tour is extra special since it is their reuniting tour after 10 years! You could tell how excited they were and how much they genuinely have fun while they’re onstage. Stick Figure is much newer to the scene than the other two bands, but you wouldn’t know it from watching their set! Their dub-infused reggae sound is currently blowing up all over the country (and even the world) and their live set is one-of-a-kind. Each member brings something special to the performance. 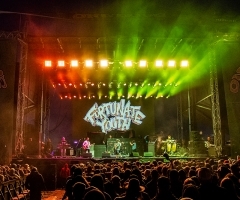 From lead singer, Scott Woodruff’s unique vocals to KBong hyping up the crowd on the keys, Johnny Cosmic’s soulful vocals and guitar skills, Kevin Offitzer and Tommy Suliman holding things down on the drum and bass, and the always-awaited features from TJ O’Neil. 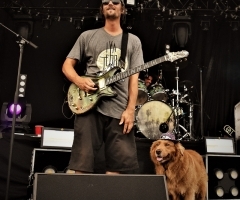 And, of course, debatably the most important member of Stick Figure, appearances from Cocoa the Tour Dog adds to their impressive show. Their performance was dynamic. It was packed with lots of energy, yet balanced with vibey instrumentals and slower jams, like one of their latest singles “Easy Runaway”. The sound of Stick Figure music filled the venue with positive vibrations and left everyone with happy hearts. What makes Slightly Stoopid such a universal band is their eclectic and diverse style that can definitely be seen through their fan base. People of all ages, races and backgrounds filled the venue: from families with young kids, older people, high school kids and everything in between. Although Slightly Stoopid is obviously heavily influenced by reggae, their performances keep you on your toes by mixing up the genres throughout their set. They went from playing songs with more of a punk rock feel that had the crowd forming mosh pits to funkier, ska-inspired tunes with a killer horn section to jam-like instrumentals to covering and paying tribute to Tom Petty and I could keep going with this, but I think you get the idea. Pepper came back up to join them onstage and a few songs later, Stick Figure came back out to help end the show with a grand finale – Scott even crowd surfed! This tour package is just getting warmed up, so make sure to catch a show near you; you won’t be disappointed! And, keep an eye out for more Top Shelf Reggae coverage of the tour coming soon.